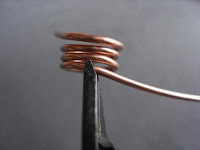 There are many tools you can use to coil wire and make consistent sized loops. 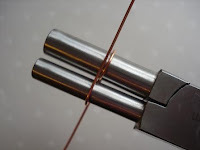 The bail forming pliers is yet another option which can help you make connectors, clasps, ear wires and jump rings. I bought the large sized bail forming pliers because I already had other tools like the 3 step loop forming pliers and wanted to avoid duplication. It makes two different sizes of rings - 9 mm and 7 mm. 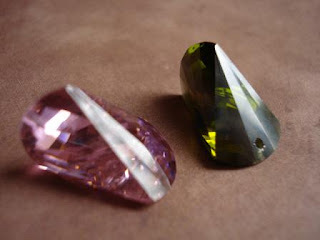 The inspiration for this tutorial are these beautiful cubic zirconia fans from Art Bead's cubic zirconia collection. These are not flat at all and presented a design challenge! They are shaped and holed such that depending on which side you display, the fan can be broadside down or up. 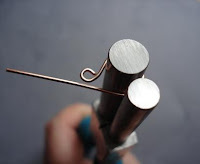 They are on the small side (18 mm x 12 mm) so I used the bail forming pliers to make some decorative figure 8 connectors for this wire working project. 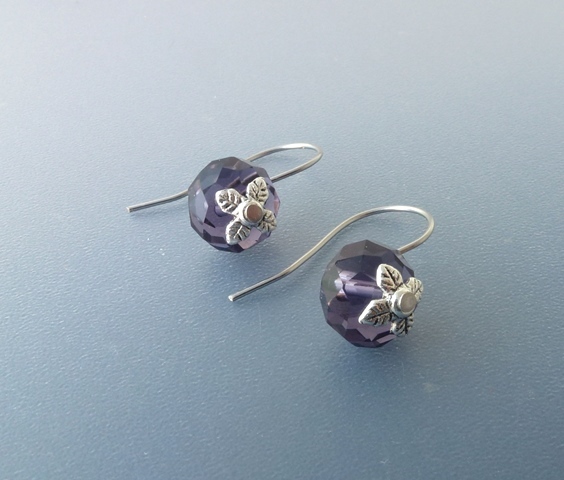 For earring inspirations check out Tammy Powley's CZ faceted fan earring tutorial. First cut about 4 1/2 " of 20 G wire. Straighten it if necessary. Grasp the wire somewhere close to the middle. Now wrap one end completely around one cylinder - I've rotated the pliers anticlockwise to show the wire ends going in opposite directions. 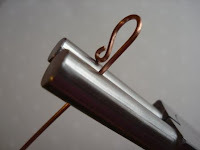 Take the wire end on the right and wrap it around the other cylinder and down the other side. Now this is the part which I suspect frustrates people. Take the wire form off the pliers and you can see it looks unfinished. The trick IS to remove it and reinsert the pliers to complete the formation. First reinsert one of the cylinders. 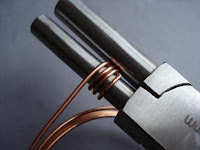 Now take that wire end and wrap it completely around the cylinder. Do the same for the other loop. Now you have the figure 8 connector! You can trim the wires close to the middle of the figure 8. I chose to leave a bit more wire to do some decorative loops. Some light hits with a plastic mallet or harder flattening whacks with a hammer will work harden the work. 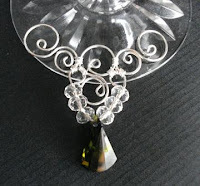 Here is the completed necklace focal featuring the cubic zirconia fan. I wired three of these connectors to a simple double eye looped wire bearing the fan pendant and some clear crystals. All it needs is two chain lengths on either side and the clasp to complete it! 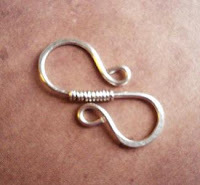 As the bail forming pliers has 2 size loops, you can make S-clasps with them very easily. Cut a 3" length of 18G wire. Make a small loop at one end. 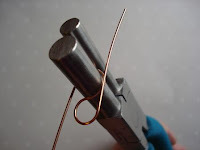 Then wrap that end around one of the cylinders of the pliers. 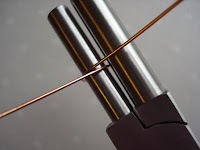 Don't complete round the wire around the cylinder. You need a straight part to the clasp. 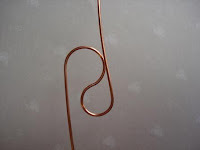 So grasp the wire as you see in the picture. Now wrap the rest of the wire around the second cylinder as far as it will go. 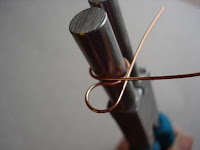 Trim the wire and form a small loop. Bring in the looped ends closer to the stem of the S. I hammered my clasp to flatten the big loops and added some decorative wire wrapping. 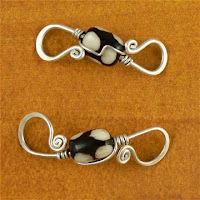 If you'd like to include a bead in the clasp, check out Sharilyn Miller's beaded clasp tutorial (Update : link no longer works). She is a bail forming pliers virtuoso! I really like how she flattens the ends of the wire before making the small loops. 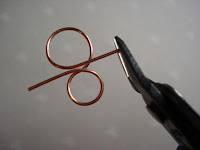 If you look at the clasp tutorial pictures you will see the beginning of making ear wires! I found the bail forming pliers so easy for this task, I am going to retire my marker pen mandrel and use them instead. The wire doesn't need to be as long as you see in this picture. 2" should do the trick. Use the larger cylinder. 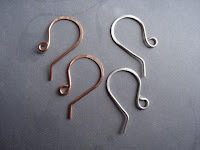 Check out my past tutorial on how to make ear wires with variations for further tips. Check out this popular and easy way to make all in one earrings with headpins, small beadcaps and beads of your choice. 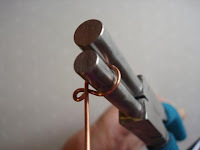 You can also make jump rings in 2 sizes. 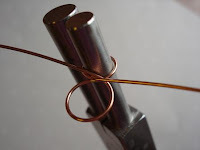 Check my past tutorial including the video on the 3 -step loop forming pliers to follow the motions required to form the wire around the cylinders. 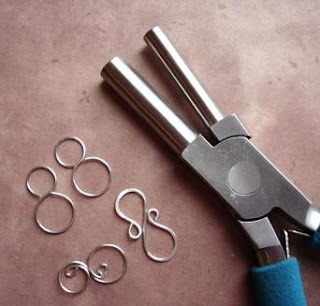 If you don't have a jewelry saw set up, remember to flush cut the rings properly - alternate the flat side of your pliers as you cut each ring so you get two flat ends per ring. Aaa-mazing!! 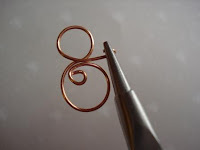 That's gorgeous - and what's more... your tutorial makes me feel like even I could do this (so far I've been kind of a 'dud' when it comes to wire work). Thank you once again Pearl. Brilliant! Wow! This is a fabulous tut!!! I'm sooo going to have to get one of these tools. I love all the options it provides and your finished focal is stunning! It is now officially on my wishlist! I've wanted to purchase a pair of bail making pliers for awhile. I will now that I've read your blog. It does make it much easier to make things the same size each time. By the way, these are beautiful. Great pliers Pearl...I've a pair of the three tiered ones, but never used these kind! Love what you did with the fan CZ...looks so pretty!!! Great information as always! I'll need to get a pair of bail forming pliers! Man I want a pair of those pliers! 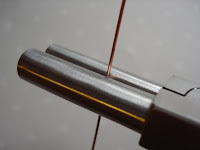 There are so many cool tools and materials for the jewelry maker, aren't there? I want them all! I love my Wubbers! I have two sizes which I use all the time. Heck, most of us could spend a fortune if only our budgets would allow us to! Great tutorial Pearl. I have a pair of bail forming pliers, and I love them. Use them all the time, making my own jump rings, chain links, etc. Never thought about leaving extra wire on my figure eight connector to make decorative loops. Love your cubic zirconia fan focal. Thank you for sharing. 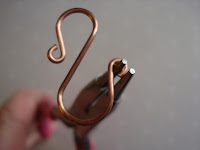 I so agree with you about the bail forming pliers being one of the most versatile tools! Thanks for the kind words too!